A lamentable issue in the construction industry is that often companies will be too large and streamlined in a trade to be able to take care of all of a customer’s needs, or the company will be too small to have the manpower and resources to adequately take care of all the aspects of a customer’s project. When a Building Maintenance company who services many large Parking garages in the Boston area found itself needing to take care of replacing the concrete and waterproofing some areas in one of their properties, They called Pumpcoat. Pumpcoat ~ PCI Contractors diversity has made us a ‘go-to’ company for problem-solving. On this particular project, our customer was experiencing a lot of cracked concrete originating in the expansion joints of the pedestrian ways of one of the garages, and also at the building’s entrance-way (front Apron). Additionally, they needed a waterproof and durable coating system for these areas. Because the building was extremely busy, the areas that needed coating could not be taken out of service very long, both for the safety of the pedestrians, and the flow of traffic/potential loss of revenue for the building’s occupants. A coating with a quick cure time was needed. Pumpcoat ~ PCI Contractors’ field service team did a new concrete pour over the previously removed substrate for the Building’s front entrance area. They then researched for the most ideal coating for this application and ended up choosing the Tremco Vulkem ‘Extreme Wearing System’ (EWS ) Coating. This coating has been designed to have extreme abrasion resistance, ‘tenacious’ adhesion, and cures quick enough so that it can be walked on an hour after finishing the coating. It is versatile enough so that it can be applied even in freezing temperatures, which allows for projects to continue in the colder months. The Vulkem EWS also protects concrete from the damaging effects of vehicle fluids such as gasoline, oils and antifreeze, and de-icing salts and chlorides as might be spread on roadways during the winter. There are four coats to the Vulkem EWS system: a Primer, Base-coat Waterproof Membrane, a Wear-coat, and then a top coat. The system retains its integrity and prevents water migration between itself and the substrate. The wear-coat has an abundance of aggregate so that it maintains high impact, abrasive, and chemical resistance. Each coat cures in an hour or less so the next coat is able to be applied. Pumpcoat~PCI Contractors applied the entire system in less than a day which was scheduled with respect to the customer’s least busy time, so they had minimum interruption to their business. Pumpcoat ~ PCI Contractors are now in their 18th year of service.Our experience continues to help find solutions to their customers problems. Tremco Vulkem’s “Extreme Wearing System” applied to the pedestrian traffic areas by Pumpcoat – fast curing and back to business! One of Pumpcoat/PCI Contractor’s Power Generation customers in Connecticut recently built a new storeroom. Their previous one was no longer large enough. Once the new structure was built, there were a few components that PCI Contractors was able to lend its expertise to completing it to spec. The flooring the customer required was a non-skid floor that mitigated moisture. PCI installed a new epoxy flooring system, of approximately 1700 square feet. The first coat was of Duraglaze MVP primer. Duraglaze MVP can reduce moisture levels up t o 99 %. It also provides an excellent basecoat. The top-coat applied was Duraflex Armor Top pigmented gloss coat. This is a protective Urethane coating – it is specially formulated for high traffic areas to protect against chemicals and wear. By broadcasting Aluminum Oxide grit into the coating, it creates a non-skid surface that is safer for personnel to walk on. PCI applied line-striping the floor to demarcate the aisles, forklift lanes, and other safety markings. Also called for was a concrete pad of approximately 400 feet which PCI poured in an area of the warehouse. This pad created an area where machinery could move around on without worrying too much about cracking and chipping. The next phase of the new warehouse was moving the steel shelving and cabinets from the old storeroom to the new one. PCI Contractors subcontracted a local company with experience in that area. They transported the shelving, cabinets, mezzanine system and set it up in the new storeroom, making sure that it was done to safety code and replacing any lost parts. Finally, PCI provided water drainage and waterproofing to the Exterior wall of the new storeroom. This wall in particular was noted to be in a high risk area for standing water build-up and possible seepage. Approximately 2 feet deep trenching was dug 50 feet along the exterior of wall and backfilled at a slope to promote better drainage. After power-washing the wall, A BASF Concrete Waterproof coating was applied, and corrugated piping put along it for drainage of rainwater. For a multitasking project like the new storeroom building, Pumpcoat/PCI Contractor’s years of experience and adherence to safety and quality can help our customers get it completed on time and without the headaches. Flat roofs that are found at plants, factories and other industrial buildings will almost inevitably end up with leaks at some point in their history. Pumpcoat~PCI Contractors gets several calls for leaks, roof repairs and coatings each season. Areas on roofs where something sticks up from the roof – like piping, vents, exhaust fans, etc. are called penetrations. Anywhere there is a penetration, the area is prone to leakage. Penetrations are surrounded by metal strips and caulking, called flashing, that acts as weatherproofing. Over time, flashing and caulking can break down, allowing water to flow down through the roof coating and cause damage. Although leaks may seem minor, they can lead to much bigger problems like mold, rust & corrosion, water damage, rotting of walls and ceilings among other issues. 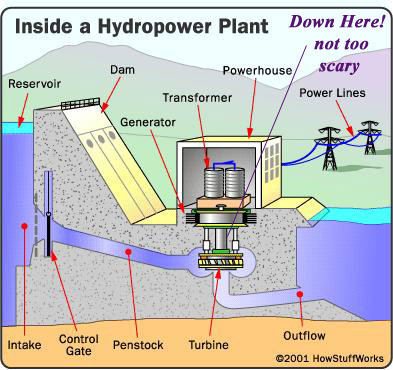 Also, water can damage expensive equipment in a factory or power facility. Pumpcoat~PCI field service professionals are experienced in finding the source of the leaks and repairing them. Pumpcoat-PCI received a call from one of our power generation customers in Western Massachusetts. They were experiencing several leaks of unknown origin when the snow melted. After careful inspection, PCI’s service professionals were able to pinpoint the sources of the leaks. They replaced the flashing & caulking around the penetrations. The entire roof was then coated with a two-part EPDM rubber membrane called CIM 1000. This product forms a seamless, waterproof, elastomeric membrane. It meets tough VOC requirements, and is available both in black (for absorbing the sun’s rays) and white (for repelling them). This can help with defraying the building’s heating or cooling costs depending upon the need of the facility, which makes it a very “environmentally friendly” choice for coatings. The CIM 1000 material combines the flexibility of a urethane coating with the water impermeability of asphalt that lasts for several years. 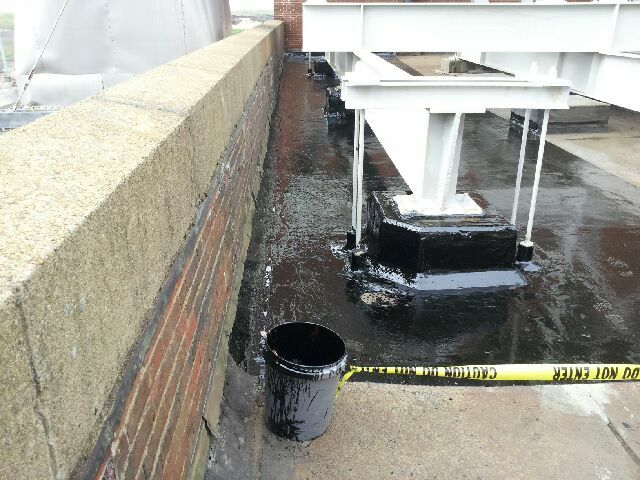 The PCI field service team were able to repair the leaks and coat the roof in a quick and efficient manner without disruption to the customer’s schedule. The facility manager was very satisfied with the job, which not only saved him money from damage to the building and equipment, but also resulted in an energy savings for the building. If you are experiencing leaks or are looking for a roof coating that is durable and cost-efficient, call Pumpcoat~PCIContractors at 508-540-5878. Roof coating at power plant, used an EPDM Elastomeric Membrane that is black to absorb the sun’s rays and save in energy efficiency. note the repaired flashing around the penetrations. When flashing & caulking is old and begins to break down is when leaks can begin. Air Park Building Doors: Last Fall, a bad storm had come through the area and damaged one of the metal buildings at a local airpark. The doors had been nearly torn off and were badly mangled. PCI sent a Field Service Professional out soon after and took the appropriate measurements for new doors. Through one of our affiliate machine shops, new custom doors were cut, and PCI installed them with a very quick turnaround, getting the building back in working order. Cooling Tower Distribution Trays: PCI was in the process of a Cooling Tower rebuild, when it was found that the distribution trays (large pans underneath the towers that hold the cooling water) were rusted out. They were too far gone to be salvageable with our normal means of epoxy rebuild material. Our Field Service team took measurements and we had new trays made to order in a short amount of time. The trays were given an epoxy top-coat to help withstand future rust and erosion, then installed into the tower. The total Cooling Tower job was still finished on time, with a very minimal increase in the original estimate. 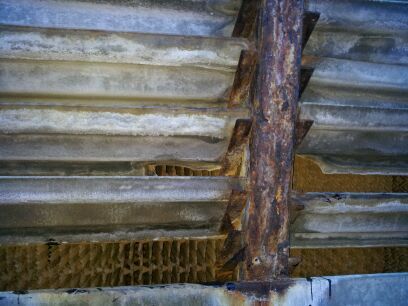 Cooling Tower Louvers: Another Cooling Tower PCI was repairing had severe corrosion issues with the air intake louvers on front. Our Field Service Team measured and diagramed a set of replacement louvers which were then fabricated at our affiliate shop. They were installed when the tower was put back together and functioned perfectly. The new louvers added efficiency to Cooling Tower as a whole. Jet Enclosures: PCI Contractors were servicing a Power Generation’s Jet Enclosures. This is a small unmanned facility with several buildings that housed jet turbines and equipment used to produce additional power for the grid. Many of these buildings had begun to show external wear from the environment. A few of the buildings sported metal awnings above the doors as additional protection from the elements. The awnings had begun to rust severely. PCI measured and fabricated new awnings on site as part of the total maintenance package provided to the customer for that facility. Pumpcoat ~ PCI Contractors has the ability to provide a full complement of services relating to facility maintenance. From metal issues to coatings to mechanical equipment like cooling towers or heat exchangers, PCI’s service people are well versed in solving problems. Cooling Tower Air Intake Louvers: Before ~ note severe rust and corrosion. (prevents the louvers from functioning efficiently for air intake). Cooling Tower Air intake Louvers. – New Louvers fabricated from sheet metal not only looks better but increases the efficiency of the unit. Pumpcoat ~ PCI contracting was contacted by a Construction contractor we have worked with before, regarding doing a floor in a Seafood Restaurant factory cold prep room. The floor needed to have the old coating removed, and a new one installed. The room was approximately 600 square feet and contained freezer units and a prep area. There were a number of issues that made this project challenging. As this room was where food was stored and prepared, any coating we applied had to be safe for use around food. The temperature was regulated to 38 degrees F, which meant that the coating curing time would also be affected. Lastly, the factory needed to be able to get the room back in use fairly quickly, so that whatever product was chosen couldn’t have a long cure time. Originally the spec called only for removing the old coating which would be done by shot-blasting. The customer then decided they wanted to seal the underlying concrete as well. Unfortunately, the condition of the concrete floor was not great. Once the old coating was removed, the original floor was found to be uneven and not aesthetically pleasing, so sealing it would have only added a clear moisture retardant coat to the floor, not fixed it as they were expecting. Pumpcoat ~PCI decided that instead of just a sealer, that an epoxy system would give the best result for what the customer expected for the end result. A few of the products considered were FDA approved, but the cure time was several days, which was too long. Some of the others would cure quickly, but not recommended for use around food. Ultimately the product that best fit the bill for the job was Duraflex Polycrete MDB, with TF top coat. This epoxy system is both NSF (potable water use approved) and FDA (Food & Drug administration) approved for use around food, and had a quick cure time, so the factory cold room would be back in service quickly. Pumpcoat – PCI Contractors have used Duraflex products for many years with excellent results. There are several flooring systems available, to cover anything from the need to withstand aggressive chemical environments, to high temperatures, or thermal shock resistance. They are ideal in food processing plants or kitchens as they meet the stringent guidelines for those industries. They are also easy to clean, have high traction for increased safety, and come in a variety of colors and broadcast systems. The project took one day for completion, and they were back in service by the next day. The construction contracting company was pleased because they were able to find a value-added service of floor prep and coat for their customer. The factory customer as happy because they had an updated floor that suited their needs with minimal down time. Pumpcoat ~PCI contracting worked with the customer to find the best coating to suit all their needs. Have your own coating dilemma? Need advice on the right coating for the job? Call Pumpcoat today to discuss options and find the best coating for your needs 508-540-5878. How Low can you go? Sometimes in the course of repair work, real life scariness comes into play. Deep holes, rushing water, confined spaces…. These repairs are not carried out by the faint of heart! For the past few years, Pumpcoat ~ PCI Contractors have been called in to do repairs on various areas on a large shaft for a hydro-electric facility in Lowell, Mass. We repair a variety of shafts on a regular basis, but what makes this repair unique is that it several stories down in a pit that is regularly filled with rushing water. 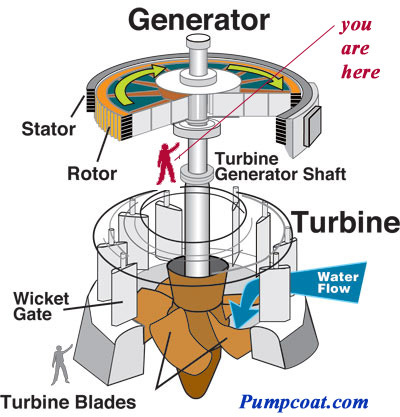 The shaft is part of the turbine system that generates the electricity for the plant. The entire piece of equipment goes down about 100 feet and has a series of wicket gates that open and close to control the flow of thousands of gallons of water from the dam through. Annually, the pit is de-watered for inspection and repair. Our workers went down approximately 60 feet (about 6 stories) into the pit via ladders and with safety harnesses. Although the water flow had been closed off, they could still hear the eerie sounds of the water many feet beneath them beyond the wicket gates. The walls around them in the pit were slick and slimy from being under water most of the time. The repair required a first step of sand-blasting certain areas of the shaft. After which an NDE was carried out (NDE stands for Non-Destructive Examination) An NDE can include a variety of tasks such as Visual Examination, Ultrasonic testing, Liquid penetration and others. The Examination results show where there are corroded or pitted areas on the shaft that need repair. Once the NDE had been performed, the area is re-blasted and wiped clean. This brings the surface down to bare metal and removes any excess chips, rust or corrosion so the epoxy coating adheres to the surface. PCI Workers then applied a coating of Arcor EE-11 Ceramic filled epoxy. This epoxy is perfectly suited for immersion service, and produces a tough, chemical resistant coating. The workers clean up and get back out of the pit, and once cured, the shaft is put back into service. You hear stories from time to time in the news about repair workers getting hurt or killed on the job. So how does this happen, or rather, how can it be kept from happening? Several safety measures are taken to prevent accidents on the job. In the case of the deep pit shaft repair, we had a Safety Rescue team onsite whose sole job was to have the equipment at the ready to extract a person if their safety harness failed or they ran into some other issue while at the bottom of the pit. Pumpcoat workers are Confined Space Trained, so they had the necessary skills and Personal Protective Equipment (PPE) for that particular job. PPE can include respirators, suits, gloves, masks, eye & ear protection. Other safety measures can that be used for different projects include air monitoring (for build-up of toxic gases) and air compressors with hoses to blow in fresh air to areas where work is being performed (like the bottom of a tank where other gasses can stagnate). If the equipment normally involves moving parts, a Lockout/Tagout is performed. (A safety protocol that can include a padlock inserted through to physically keep the equipment from being turned on, kind of like a chain through bicycle spokes). Most facilities have additional protocols set up so they know where all personnel & contractors are, and have extraction plans set up in case someone gets hurt. These are just some of the safety measures that are in place to prevent accidents and ensure worker safety. The truth is that much of what the average person takes for granted – running water, electricity, heat and air-conditioning, etc. is handled by variety of infrastructure equipment that needs to be kept running and in good shape. The invisible hands of modern conveniences are really the culmination of many people who are responsible for keeping the pieces in working order. Some repairs can be scary but proper safety precautions can minimize the risks.